Following a calamitous HRM presentation meeting concerning the proposed Blue Mountain/Birch Coves last week, the Ecology Action Centre organized a response gathering at Dalhousie University on Wednesday Night, June 29th. Smoothly run with flashes of passion and humour, and bursting with precise information, the meeting was the antithesis of the previous disaster where no-one was allowed to ask questions and the 300-plus crowd tried to cram into the 85-seater hotel conference room. 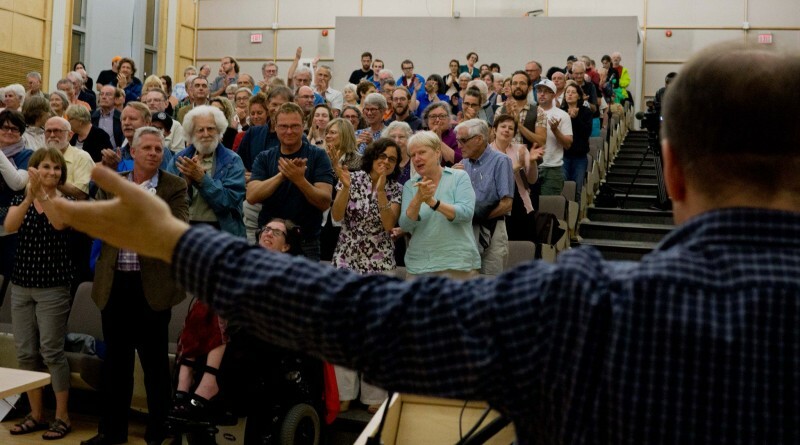 The Dalhousie Lecture Hall, with a capacity of 700, was about half full, an astonishing number concerning it was a week full of graduations and looming vacations. EAC Wilderness coordinator Ray Plourde acted as master of ceremonies, blending a talent for disgorging facts and figures with some old-time revivalist oratory that had the audience delivering several standing ovations. With a table full of allies including The Halifax Field Naturalists, The Halifax North West Trails Society, and Fusion Halifax, Plourde implored the crowd to become ‘Blue Mountain/Birch Cove Lake Park Rangers’ in order to save the imperiled Wilderness Zone from a private sector development that may be looming in the near future. A July 4th deadline for comments to the City will be followed by a mid-month council meeting that could approve the dismemberment of the park. Time is still of the essence and yet opposition to development is still being rallied.